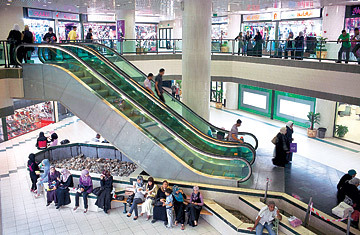 Shoppers at the new mall in Nablus. This city's historic landscape of rolling hills and groves of knotty olive trees is undergoing something of a transformation. Multistory villas fronted by ornamental porticos and columns are rising on Ramallah's hilltops along with glass and marble office buildings. There are newly paved roads. The city's first five-star hotel, a Mövenpick, is opening this month. Across the West Bank, similar scenes are unfolding. Building cranes pierce the sky. Outside Nablus, new car dealerships sell everything from BMWs to Hyundais. Inside the ancient city, the first movie house to open in 20 years, Cinema City, is hugely popular. Last year the Hirbawi Home Center, a five-story shopping mall selling luxury items like plasma TVs, opened just outside Jenin. Consumer goods are only part of the story. Industries from finance to housing to a high-tech sector are developing too. Such activity marks a fundamental political-economic shift among the ruling Palestinian Authority (PA) apparatchiks and the Palestinian business community, upending former PA President Yasser Arafat's long-entrenched policy of nation first, institution-building later. The current leadership believes that creating a sustainable economy is essential to creating an independent Palestine. "We need to work on the economic front," says World Bank veteran Mohammad Mustafa, CEO of the Palestine Investment Fund (PIF), a quasi-governmental financial institution. "It is part and parcel of the overall struggle toward statehood." Indeed, the IMF has reported that the Palestinian economy is on track to grow 8% in 2010. Israeli and Palestinian negotiators may equivocate over peace, but an economy is breaking out in the West Bank. Under Prime Minister Salam Fayyad, an American-educated economist and former Finance Minister, the PA has spearheaded an ambitious strategy to move away from subsisting on foreign-donor aid and toward attracting foreign direct investment to spur private-sector growth. Just as important, Fayyad has vastly improved security, sweeping the streets of rogue militants, which has eased the movement of people and goods. Israel has responded by dismantling numerous checkpoints that also inhibited commerce. There's also an effort to streamline the legal system  a quilt of Ottoman, Jordanian, Israeli and British mandate laws. It has all served to boost confidence in Fayyadism, as the host of initiatives in play is commonly referred to. Mahmoud Ahmad al-Takruri, regional manager of the Housing Bank for Trade and Finance in Ramallah, says that one of the positive indicators in evidence is the lending climate. "The situation is more stable nowadays, and banks have more of an appetite to make loans," he says  meaning, specifically, loans to the small and medium-size enterprises (SMEs) that are the backbone of the Palestinian economy. They make up roughly 95% of enterprises, 84% of the private sector and 55% of the GDP. Mazen Shkukani's oxygen gym on the fifth floor of a Ramallah office center is state of the art: it boasts the latest equipment, classes in spinning, kickboxing and Pilates, a sauna and even a smoothie bar. "We do very good business," Shkukani says proudly. "We are a very famous gym. We have customers that come all the way from Jerusalem and other villages." Oxygen is the third of five businesses Shkukani owns that were made possible by a series of loans he was able to obtain. Born in Kuwait to a Palestinian family, Shkukani returned in 1987 to Ramallah, where he opened a children's boutique and later worked for his family's car-rental business. In 2004, a volatile year, the part-time bodybuilder saw an opportunity to import American-made nutritional supplements. Making use of his family's business reputation and connections, Shkukani, along with a partner, secured a loan of $200,000 to launch his Sportline supplements line. A few years later, having closed out his initial loans, Shkukani opened Oxygen Gym with two partners. Each put in $143,000 and took out a $400,000 small-business loan. It was Shkukani's largest to date.